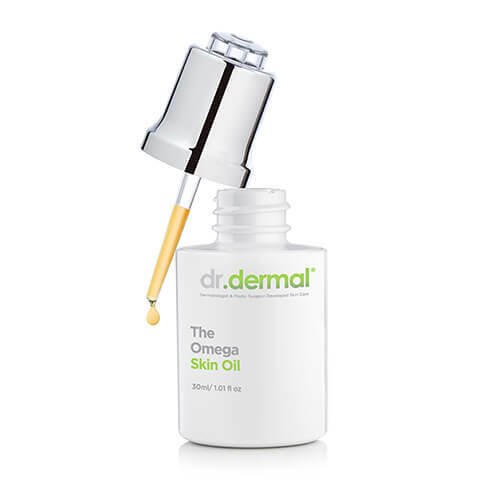 The Omega Skin Oil by dr.dermal® is the only facial oil you'll ever need! dr.dermal’s Omega Skin Oil is a complete source of essential fatty acids that encourages optimal cellular integrity and provides superior hydration to the skin. It is a non-greasy, light and rapidly absorbed hydrating skin oil that leaves no residue and instantly moisturizes and softens your skin. Your skin’s barrier is made of a bi-lipid layer consisting of ceramides, essential fatty acids and cholesterol. This superior facial oil rapidly restores your skins barrier function to hold moisture in and lock out pollutants. Your skins cell membranes require essential fatty acids for optimal structural integrity and these can be provided topically as well as supplemented with nutrition. The oil also contains pure Coenzyme Q10 which is a powerful antioxidant that protects against free radical damage. Using all phyto-oils from sustainable sources, this vegan formulation facial skin oil is suitable for all skin types. This oil is the perfect companion in winter, air conditioned environments, chronically dehydrated skins. Can also be used by all skin types for added hydration and support. The Omega Oil saved my skin in Kruger! It’s a bit thick for Cape Town, so I use it sparingly! The best facial oil that I have ever tried! I used it every single evening through the winter months. Just a couple of drops added to my moisturiser was all it took. I also love adding a drop to my foundation – it soaks in so beautifully and leaves a dewy sheen. Absolutely gorgeous product! Apply to clean, dry skin. Using the dropper, dispense two pumps into your palms and apply to your face, neck and décolletage. Allow to dry and follow with your moisturiser. Caprylic/Capric Triglyceride, Argania Spinosa (Argan) Kernel Oil, Olea Europaea (Olive) Fruit Oil, Prunus Armeniaca (Apricot) Kernel Oil, Simmondsia Chinensis (Jojoba) Seed Oil, Macadamia Ternifolia (Macadamia Nut) Seed Oil, Punica Granatum (Pomegranate) Seed Oil, Cannabis Sativa (Hemp) Seed Oil, Actinidia Chinensis (Kiwi) Seed Oil, Glycine Soja (Soybean) Oil, Retinyl Palmitate, Tocopherol Acetate, Ascorbyl Isostearate, Ubiquinone, Lavendula Angustifolia (Lavender) Flower Oil, Cedrus Atlanticus (Atlas Cedar) Leaf Oil, Pelargonium Graveolens (Geranium) Leaf Oil, Cirus Paradisii (Grapefruit) Peel Oil, Citrus Aurantium Var. Amara (Petitgrain) Leaf Oil, Cananga Odorata Var. Genuana (Ylang Ylang) Flower Oil, Steam Distilled Citrus Sinensis (Orange Blood) Peel Oil, Abies Sibericus (Fir Silver) Needle Oil, Citrus Deliciosa (Mandarin) Peel Oil, Cymbopogon Martinii (Palma Rosa) Grass Oil, Anthenis Nobilis (Chamomile Roman) Flower Oil, Matricaria Recutita (Chamomile German) Flower CO2, Pogostemon Cablins (Patchouli) Leaf Oil, Eriocephalus Punctulatus (Chamomile Cape) Flower Oil, Calendula Officinalis CO2, Viola Odorata (Violet) Leaf Absolute. Q: Won’t this make my skin greasy? A: We suggest you use only a few drops on your skin. It is light and rapidly absorbed so it will not leave your skin feeling greasy. Q: Will it leave my skin shiny? A: No, The Omega Oil is a dry oil, meaning it will be totally absorbed by the skin. Q: When should I use The Omega Oil? A: It can be used all day, every day, as long as it is applied last (over day/night creams). The Omega Oil creates a protective barrier, which makes it difficult for other ingredients to penetrate. Q: Can I use The Omega Oil as a day or night cream? A: Yes, absolutely! It is strongly recommended that a rejuvenating product is used at night. The Omega Oil contains essential fatty acids that will feed your skin and protect it against dehydration. For external use only. Do not use on broken skin. Keep away from eyes and mucosa. If contact occurs, rinse with water. If irritation, redness or itching occurs reduce frequency of use. If symptoms persist, discontinue use. Keep out of reach of children. Store in a dark area away from heat and direct sunlight.